Several first timers, along with great participation from the regulars, made this another successful FMT. I think we were all a little surprised when we did not hear Marvin's usual strong 80 meter signal. I was quickly checking if I was tuned to the the right published frequency, and checking to see if I had the proper antenna selected. As it turned out Marvin had lost his Amplifier and was just running 20 watts from his vintage Viking I transmitter. Many of us were still able to find him in the noise and make a reading, with some readings being quite good. WA4FJC VA Good signal tonight. HP 3586B with dipole antenna. WA3BDV EPA Could not hear WC-80. WC-40 very noisy. East Coast signals very good in EPA. WA1ABI RI Very good sigs tonight from Connie. Marvin was fair on 40m but inaudible on 80m. 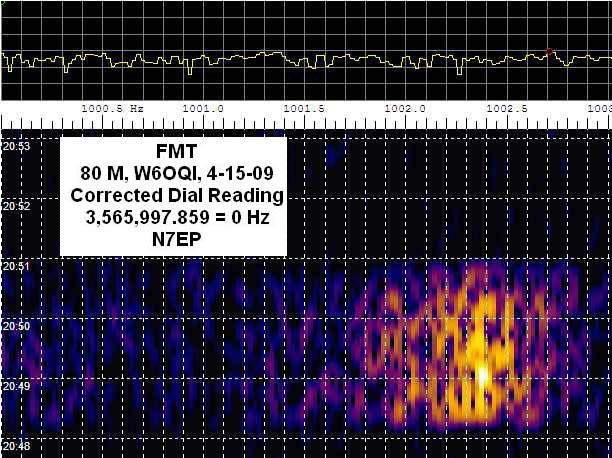 Spectrum Lab showed a signal buried in the noise, so that's what I recorded for 80m WC. Thanks Connie and Marvin for another fine FMT. W9ZB IN This time, west coast sigs were very weak at this QTH. K5CM sigs were good. W6OQI LAX Sorry about the weak 80 meter signal from W6OQI, amplifier failed and the output power for 80 meters was only 20 Watts instead of 500 Watts. 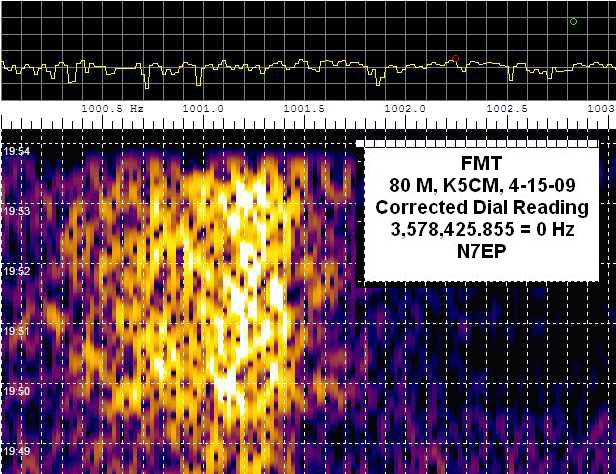 The K5CM signal was 10 over 9 on forty meters with a doppler spread of about .12 Hz. The K5CM 80 meter signal was running S 7 with about a .13 Hz doppler spread. W2FD WPA Good Signals on 40 meters from K5CM and W6OQI although there was a lot of static on all bands. 80 meter signal was good from K5CM. W6OQI was just noticeable in the noise and the frequency result for 80 meters was more of a guess than a measurement. Thanks again for the efforts of K5CM and W6OQI. W1BW EMA SDR-1000 with Ozy/Janus all clocked by Thunderbolt GPSDO. Frequencies directly as measured...was in a hurry and didn't have time to take doppler measurements of reference frequencies. W0PHD MN SSB QRM on 80M but your sig was strong and over road QRM W6OQI was very very weak on 80 meters I also had some instability on my local signal. One of these days I am going to start using the computer programs to compute the frequency. VE2IQ ON Good sigs except WC-80M quite weak here. Reported freq is average over keydown time. N9XR IL WC-80M was too weak for me to hear more than a few dits and dahs. But anyway this is my first FMT. Probably have not figured out how to measure frequency very accurately, but I thought I would give it a try and see what the newer TS-480HX would do for me here. No analysis software or anything. Just heterodynes and a scope. Thanks for the Yahoo group and letting me participate. N8OB OH I had to rush home from Radio Club meeting and try to remember what I am doing. Always fun..
N5DM STX W6OQI 80M transmission buried in the background QRN. N3FG EPA Lots of QSB and QRN here on 80M. 40M not too bad. Mny tnx. KD2BD NNJ Good signals were received from Connie on 80 with only some slow, shallow fading (low multipath). I stayed up and listened for Marvin on 80, but did not copy his signal. K9KK OK Doppler shift on the K5CM 40 meter run was 6 Hertz from the lowest to the highest measured frequency. Probably multiple paths since we are only 120 miles apart. I think I measured a bogus signal on his 80M run. Did not hear W6OQI. K7TT WWA No copy on 80 meters, no signals, just noise. K5CM very strong 40 meter signal here but couldn't find it in SpecLab display quick enough, no reading. Figured it out for the W6OQI 40 meter run and got at least one reading. Thanks. K6HGF LAX Thanks Connie & Marv. K6BZZ AZ Good reasonably stable signals from K5CM. 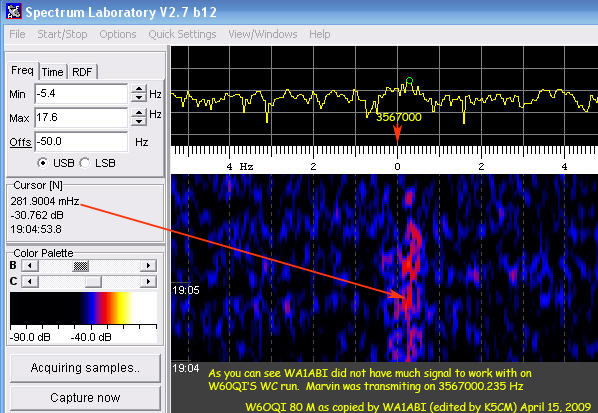 W6OQI 40 meter signal 589 but frequency not stable. 80 meter signal 569 and frequency not stable. Hard to get a solid reading. +/- about .2 Hz throughout the runs on both bands. Lots of fun and thank you both for running the tests. K6APW EB All signals good tonight, but pesky local shot noise. K5CM OK Marvin had a good 40 meter signal but I was lucky to get a reading on the 80 signal. K1GGI EMA K5CM 40m kept creeping up, about 200mHz over the run. I guessed at the middle. Sigs were easy copy, but never heard W6OQI on 80, now see he had probems, plus heavy QRN here. Thanks for another fun one. K0MZ KS I used a Heathkit HW-8 for my receiver, a Drake TR-7 for my frequency source, and a Heathkit IM-4100 counter. Keeping the counter tuned to WWV was the hardest part as it really drifts. The 80 meter signal from California was very weak tonight. Thanks for the great fun. AF9A IN Good signals on both 40 and 80 this time. Thanks Connie! Hear a brief audio snippet of Marvin's 40 Meter signal as copied by K5CM. 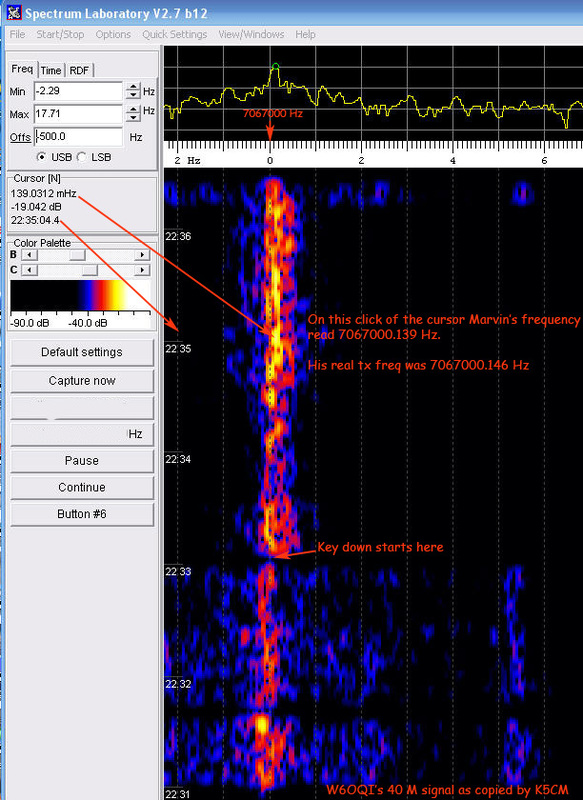 Hear a brief audio snippet of Marvin's 80 Meter signal as copied by VE2IQ. My Transmitting setup consists of a HP Z3801 clocking a HP 3336B which drives a Johnson Viking I transmitter, the output of which is attenuated by a 6 db attenuator, to then drive an Icom PW-1 amplifier to about 500 watts on 40 meters. On 80 meters no amplifier was used and the output power was 20 watts. 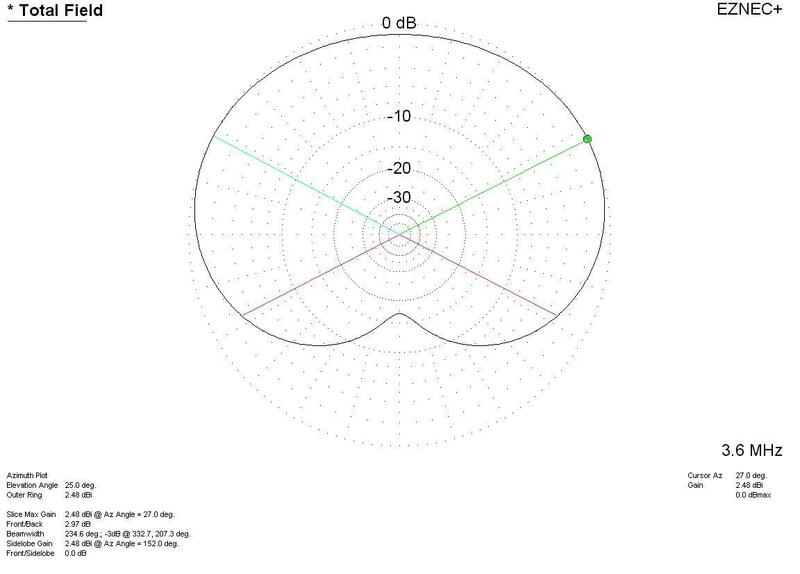 The antenna is an inverted Vee which favors north and south from the Los Angeles area.